During the winter of 1738, in the British colony of Connecticut, a few settlers in an area called Panthorne, several miles south of Farmington, petitioned to be allowed to hold worship services closer to home. Church attendance was mandated by law so the settlers traveled to Farmington every Sunday to attend services. Permission was granted and those settlers became the founders and first members of what eventually became known as First Baptist Church of Southington. The first real leader of record was Rev. John Merriman and it is believed that he held worship services in his home. In 1792, our first meetinghouse was built on a parcel in what is now downtown Southington. A new large place of worship was built in 1833 on North Main Street – the same building that was destroyed by fire in January 1953. Groundbreaking for the new – and current – church at 581 Meriden Ave. was held in February 1955. 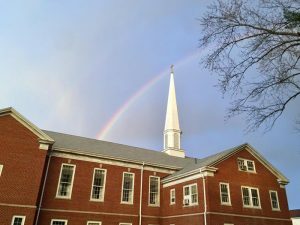 In the past 280-plus years, more than 40 pastors have led First Baptist Church of Southington. However, throughout the challenges we have kept the faith and served God to the best of our ability. We have faced many challenges, but God is faithful, He has never left us. The words above our baptistery, “I am with you always,” have served as a reminder, consolation and assurance to generations of our church family. We serve in His name and embrace the future as we remember the past.